Today we headed to the shoreline once again. 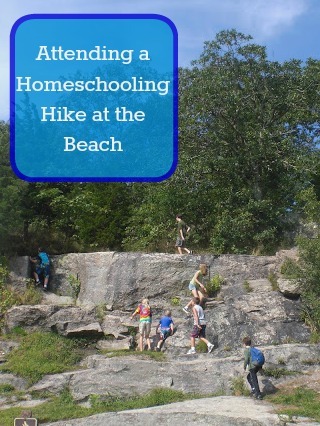 This time we went to the beach for a homeschool hike and picnic. We met up with four other homeschooling families from various parts of the state to hike around the area and explore nature. We don't often get to meet up with this group of hikers since they often hike quite far away from our home, but today they were heading to a favorite beach of ours and both myself and the boys couldn't wait to meet up these wonderful families. I decided to try giving the boys a few worksheets that they could work on in the car since it's been awhile since we've done anything resembling math, geography or science. I wasn't sure how my boys would feel about that though since I've shied away from most anything resembling a worksheet But amazingly enough they were just fine with the three worksheets I gave them. Once at the beach we met up with our fellow hikers (and a few new families too) and off we went. The kids were trying to scale rocks and boulders, they found caves and cracks in the rock walls, investigated a lean- to, saw many different shaped and colored mushrooms, learned the "leaves of three let it be" mantra when looking at a poison ivy pant, and saw a rat snake. The beach also has trains that cross frequently nearby and all the kids were excited every time it passed. We hiked for about an hour or so and then headed back to our cars and head out to the beach. There the kids played in the water, swam a bit, let themselves float in and out on the waves, and dig in the sand. They inspected the sand and learned where the different color variations came from. They built a huge fortress wall with all the kids participating and then a few of the boys made up a game-- Ninja Jump. You had to jump over the wall using your best ninja moves and land in the water. They had a blast and my kids didn't want to leave to come home.